Not much black money in India! 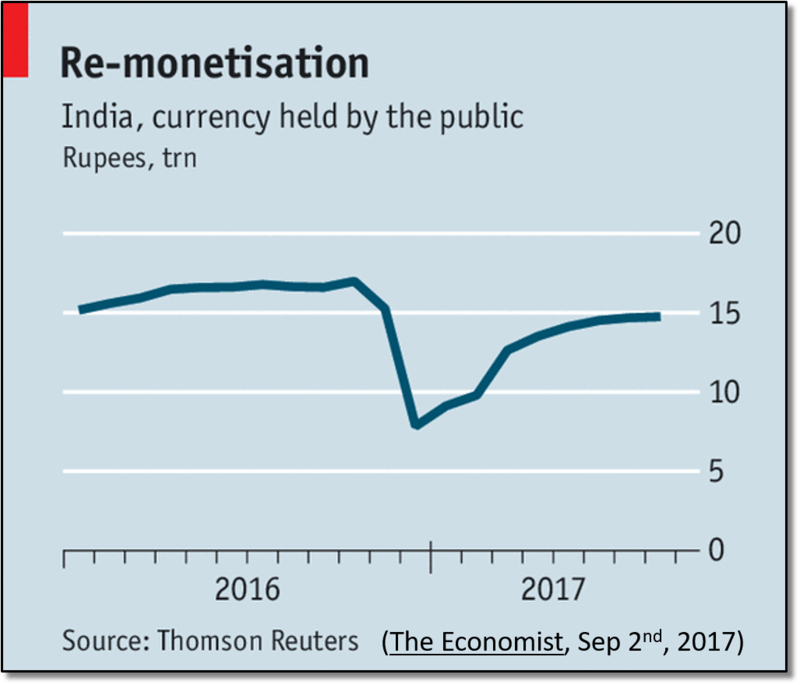 Cash circulation in India is getting close to the pre-demonetization era & 99% of demonetized cash is accounted for. This chart shows the total cash in circulation in India over past two years. On Nov 8, 2016, the government of India cancelled large denomination notes, making 86% of currency worthless. This resulted in a widespread lack of cash, the main method of transactions. However, the new notes have now almost closed this gap. There are two key learning: First, the Reserve Bank of India reports (page 195) that 99% of the cancelled notes have been received by the bank. The government expected a windfall from missing notes as part of it’s bigger campaign against black money. Second, the cash crunch was expected to move consumers towards digital transactions. Since the current cash hasn’t hit the peak seen in Oct 2016, some consumers have embraced electronic payments. For more details, see the long read article. Source: The Economist (2nd Sep, 2017).